Queen Rania stresses need for peace:"If you want to strengthen the moderates, people have to see the dividends of moderation"
(Office of Her Majesty, Press Department - New York) During day two of the Clinton Global Initiative in New York City, Her Majesty Queen Rania Al-Abdullah stressed that the only way to create a stable and secure world is to address global injustices, specifically in the Arab world. "The rift between east and west has deepened," she said, "that's something we really have to address. Extremist ideology is getting a lot of resonance... [It] has always existed throughout history, but always on the fringes because by nature human beings are moderate. But what happens is they are being pulled into the center by two forces: the lack of knowledge we have of one another …and grievances not dealt with," said Queen Rania during Thursday's panel, titled Managing Diversity in a Globalized World. 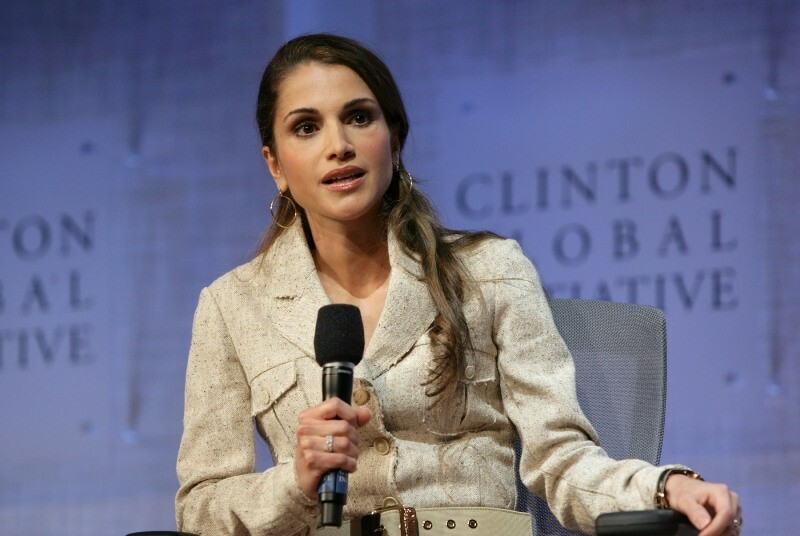 Queen Rania, who is a strong advocate of cross-cultural dialogue, said that only through person to person interaction, can the global community begin to connect. "Living in the same neighborhood is not multiculturalism. You have to invite people into your home," she said, "This nuanced approach is critical, otherwise we cannot understand each other." Her Majesty cited the unresolved conflict between Palestinians and Israelis as one of the biggest obstacles facing global security. The conflict, she said, "acts like a blockade that rivals any army or any navy from stopping good will from flowing because there's so much frustrations, so much lack of hope. This is the issue that is at the core of our region and in the heart of every Arab." Queen Rania's message here was clear: The more injustices there are the more leverage the extremists have to pull people into their ranks. Another example of injustice in the region was the war in Lebanon. "In Lebanon… innocent civilians were being killed. We were seeing, on a daily basis, bodies of babies being put in plastic bags and vital infrastructure destroyed. A quarter of the population was displaced." As a result of this, Her Majesty noted that there was a risk of moderation losing ground and losing currency in the region, "So if you want to strengthen the moderates, people have to see the dividends of moderation, they have to see the dividends of peace and now they're not seeing that… They have to see justice and an honest engagement in their cause." "It takes courage, global commitment and honest brokers, but we have to do it... Military action is not the way to deal with things… All of us have a stake in that peace," said Queen Rania. Other participants in Thursday's panel included Archbishop Emeritus Desmond Tutu and President of Afghanistan Hamid Karzai. Newsweek International Editor Fareed Zakaria moderated the panel. Both Archbishop Tutu and President Karzai underscored the need for cross cultural understanding and dialogue. "We take the voice of the bad as the voice of the people," said Karzai, "we forget the people… and that has to stop." Desmond Tutu said, "there is no faith that I know that propagates murder as a principal of religion… faith propagates compassion, justice, love and caring. I am deeply concerned [when someone says something like] Muslim terrorism, I haven't heard people describe Oklahoma as an example of Christian terrorism…. Most Christians would be appalled. We would say that is a perversion." At the start of the session, Former US President Bill Clinton introduced four new commitments: the commitment of $40 million to pass the California Clean Energy Initiative; the launch of new public service announcements to educate and inform people in Africa and the Caribbean about AIDS/HIV; and new partnerships to establish peace in Rwanda by creating permanent forms for debate at many levels; as well as a $500 million commitment to fund microfinance in Africa and Asia over the next five years which at least four million people will benefit from.